I read this article and found it very interesting, thought it might be something for you. The article is called Does Saving Cause Lending Cause Investment? (No.) 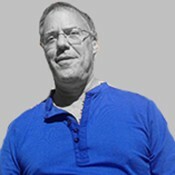 and is located at http://evonomics.com/saving-cause-lending-cause-investment-no/. Households save money and lend it to businesses, who invest it in productive enterprises. That’s the economic story you’ve been hearing your whole life, right? Or at least since Econ 101. Saving funds investment. That core idea is embedded (and unquestioned) in modern macro: the Solow growth model, IS/LM, the lot. 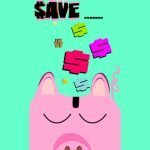 Put aside that the basic bookkeeping of this idea — that personal saving creates “savings” that “fund” lending and investment — doesn’t make any sense. (It’s an error of composition; you have more savings if you save, but the economy doesn’t.) Let’s look at history: when households save more, is there more lending and (business) investment — either immediately or a few quarters/years down the road? Otherwise, eyeballing this, it’s pretty much impossible to tell if these measures are correlated. When saving goes up or down, do lending and investment do likewise (concurrently, or some time later)? They’re all over the place. So let’s use software to look at correlations between them. A correlation of 1.0 means the two measures move perfectly together — if X goes up, so does Y, by an equal amount. A correlation of -1 means they move perfectly in opposite directions — if X goes up, Y always goes down by an equal amount. • Personal saving and commercial lending seem to be lightly correlated. The correlation declines over the course of a year, but then increases two or three years out. It’s an odd pattern, with a lot of possible causal stories that might explain it. 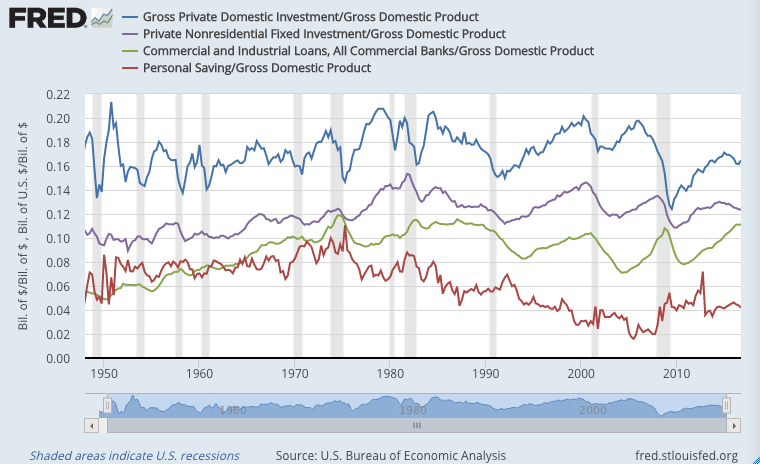 • Personal saving and private investment (including both residential and business investment) are very weakly correlated, and what correlation there is is mostly negative. More saving correlates with less investment. • Commercial lending has medium-strong correlation with private investment in the short term, declining rapidly over time. This is not terribly surprising. But it has nothing to do with private saving. • Perhaps the most telling result here: Personal saving has a significant and quite consistent negative correlation with business investment. Again: more saving, less investment. This directly contradicts what you learned in Econ 101. • The last line — commercial lending versus business investment — is most interesting compared to line 3 (CommLending vs PrivInv). Changes in commercial lending seem to have their strongest short-term effects on residential investment, not business investment. But its effect on business investment seems more consistent and longer-term. I’ll leave my gentle readers to ponder those only-somewhat stylized facts. Here’s the spreadsheet for any who want to explore further. Richard Florida: It's Not (Just) the Working Class. It's the Service Class.